Two CD edition. The Musical Mojo of Dr. John captures a star-studded concert at New Orleans' Saenger Theatre, with Dr. John joined by a stunningly diverse assortment of notable guest artists. They perform 22 songs written, recorded and/or popularized by Dr. John during his prolific six-decade career, honoring his large and still-growing musical legacy. The performers include Bruce Springsteen, who duets with Dr. John on the 1973 smash "Right Place Wrong Time"; Jason Isbell, who delivers a heartfelt "Blow Wind Blow"; John Fogerty, who performs the raucous Crescent City anthem "New Orleans"; Mavis Staples, who brings gospel fervor to "Lay My Burden Down"; Widespread Panic, who lend musical muscle to "Familiar Reality"; and Ryan Bingham, who delivers a haunting "Back by the River." 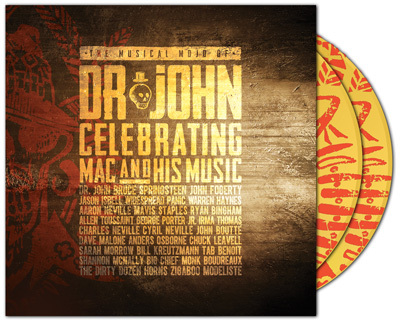 Fittingly, The Musical Mojo of Dr. John also features memorable performances by numerous New Orleans legends, including Allen Toussaint, Irma Thomas, Terence Blanchard, John Boutte, Big Chief Monk Boudreaux, the Dirty Dozen Brass Band, George Porter Jr. and Zigaboo Modeliste of the Meters, and Aaron, Charles, and Cyril Neville. Bassist Don Was served as the project's musical director, leading an all-star house band that also included Allman Brothers Band/Rolling Stones keyboardist Chuck Leavell, renowned NOLA pianist John Gros, Funky Meters guitarist Brian Stoltz and journeyman drummer Kenny Aronoff, as well as Dr. John's longstanding musical compatriot, trombonist Sarah Morrow.